Continuity mistake: When Jimmy Stewart is talking to his girlfriend, he gives her a flower, and at different points in the conversation, she has it over her shoulder, or on her lap, depending on the angle of the shot. Alice Sycamore: Have you ever been in a monastery? Tony Kirby: No, but I'm the fella who got caught in a cave once. Alice Sycamore: Were you? Whatever happened to you? Tony Kirby: Well, the cave caved in and I haven't been heard from since. Boris Kolenkhov: I feel so good, life is running around inside of me like a squirrel. Rheba: Grandpa go to the graduation exercises today? Rheba: I wonder how many people Grandpa's going to bring home for dinner tonight. 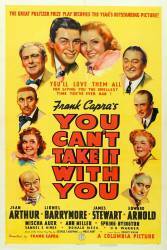 Essie Carmichael: I don't know, it all depends if he goes walking in a park. Rheba: Well let him bring them, I'll be ready for them.